Fear is a great motivator. It has been used for centuries to control the way we build and live in our communities, almost always to bad effect. On a large scale, fear of nuclear attack was a key factor in motivating the country to build the Interstate Highway System after World War II, which devastated city neighborhoods by facilitating the suburban sprawl that characterizes so much of our landscape today. On a smaller scale, fear of "undesirables" causes park after park and sidewalk after sidewalk to be remodeled without seating, shade, vendors, or other amenities that might encourage the positive public activity that discourages crime and disruption. Time and again these lessons are forgotten or abused, to the extreme detriment of our quality of life. What we end up with are downtowns and "edge cities" that are alienating, dull and inhuman. They are built on fear, fear of "negative activity," fear of interaction with any other people, fear of crossing the street, even fear of the weather! This fear is self-reinforcing and locks us into a world that is disconnected, difficult, and uninviting. Blank walls and giant buildings out of scale with the street are designed to intimidate, to proclaim the ego of the designer instead of nourish a sense of place among residents. Now we have a new fear to add to the list: fear of terrorist attack. The danger is that this fear can translate into a kind of fortress mentality. 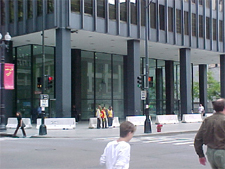 In Chicago after September 11, for example, the managers of one federal building immediately put concrete dividers up in their formerly bustling plaza, blocked passageways between spaces and cancelled the farmers market and other events. Another federal building, however, is open and thriving - the displays and exhibits still run, and people find it reassuring to be able to come together. Mayor Daley has promoted this latter approach. From our perspective at Project for Public Spaces, the safety and fear factors are real, but the methods to counter them do not necessarily have to result in sterile, alienating places. The way to revitalize a plaza is to invite the public to share in its design and planning. And people in communities, from merchants to business leaders to residents, have many creative ideas for programs and activities in public spaces, if they could only be given a voice and proper forum to be heard. These spaces need to be designed with flexible uses in mind, always taking into account that a mixture of sun and shade, food, water, and a good view of the passing scene are essentials. We have found that a good place provides a range of things to do ("uses and activities"); is easy to get to and connected to the surrounding community ("access"); is safe, clean, and attractive ("comfort and image"); and, perhaps, most important, is a place to meet other people ("sociability"). Security officials we have worked with on federal buildings across the country agree with us that an actively used, thriving public plaza is much safer, and easier to police in the long run, than an empty one. The public's need for gathering places is evident, now more than ever. New York's experience is telling. In the weeks after September 11, all over New York City, people gravitated to public places. Along the Brooklyn Heights Promenade, with its views of the now-incomplete Manhattan skyline clouded by dust and smoke, a quiet, uninterrupted vigil goes on, a month after the initial attacks. In Union Square and Washington Square, people offered comfort and stories to each other, and set up makeshift memorials along storm fences and on the pedestals of statues. Most of these memorials are wiped away by the city every morning, but people return to rebuild them every night. In addition, firehouses have become memorials themselves, their entranceways filled with candles, flowers and notes from schoolchildren. All of these people, all of these places, help us to re-affirm the value of public life in the face of such overwhelming violence. The need to gather, to share stories, to celebrate, protest and grieve in a common place is a basic, human, and universal. We must continue to allow - and encourage - the diversity, culture and commerce of New York, and all our communities to thrive in healthy, livable cities, markets, parks and neighborhoods. We cannot afford to react by building higher fences. Instead we must come together on common ground to re-establish our communities as the foundations of a civilized, compassionate society.